PAPA ROBBIE.NET: Ron Paul Revolution??? WEST PALM BEACH, Fla. - Republican presidential hopeful Ron Paul has received a $500 campaign donation from a white supremacist, and the Texas congressman doesn't plan to return it, an aide said Wednesday. Don Black, of West Palm Beach, recently made the donation, according to campaign filings. He runs a Web site called Stormfront with the motto, "White Pride World Wide." The site welcomes postings to the "Stormfront White Nationalist Community." "Dr. Paul stands for freedom, peace, prosperity and inalienable rights. If someone with small ideologies happens to contribute money to Ron, thinking he can influence Ron in any way, he's wasted his money," Paul spokesman Jesse Benton said. "Ron is going to take the money and try to spread the message of freedom." "And that's $500 less that this guy has to do whatever it is that he does," Benton added. Black said he supports Paul's stance on ending the war in Iraq, securing U.S. borders and his opposition to amnesty for illegal immigrants. "We know that he's not a white nationalist. He says he isn't and we believe him, but on the issues, there's only one choice," Black said Wednesday. "We like his stand on tight borders and opposition to a police state," Black told The Palm Beach Post earlier. On his Web site, Black says he has been involved in "the White patriot movement for 30 years." During the past month or so the conservative blogsphere and media has finally discovered the fact that GOP Presidential hopeful and Texas GOP Congressman Ron Paul has some very strange supporters. During the past months on Blogcritics, I have been exposing various and sundry rather tawdry aspects of the whole anti-immigration movement with profiles on John Tanton and Tom Tancredo. The Blogcritics piece I recently did about the white supremacist assault on Senator Lindsey Graham is garnering some interesting comments from the far right. But no series exposing the extreme and far right forces distorting the once-honorable conservative agenda could possibly be anywhere near complete without a commentary about some of the supporters of Ron Paul. This isn’t the first time Ron Paul has run for President. In 1988 he did so as a libertarian candidate, attracting little attention. This time, though it is different as Paul and his supporters have mastered the art of the internet candidacy and almost defined a new and improved way to raise funds. Instead of going for a few high dollar supporters, they are going for large numbers of small dollar donors, and are rewriting the way fundraising is done. Conservative bloggers are patting themselves on their ramrod straight backs for finally facing the fact that their movement is being hijacked by white supremacist forces from the far right. Unfortunately they are miles behind the curve, and just a little too little too late as far as I am concerned. Congressman Ron Paul has some very nasty white supremacist friends. If the problem dated only to this election cycle it would be one thing, but Paul has a past history of making some rather racially insensitive remarks, on a rather consistent basis. In 2004 Paul made a short statement from the floor of the US House of Representatives about his refusal to vote for the renewal of the 1964 Civil Rights Act. Any other candidate would unequivocally reject that money as soon as its donor’s identity was known. That Paul’s campaign needs time to think about it is shocking. Also of concern is the fact that Paul’s campaign has ignored my repeated attempts to interview the Congressman for JTA, the Jewish newswire service by which I am employed. I had intended to write a story about the Congressman, and to provide him with the opportunity to distance himself from his extremist supporters, to clarify his position on Israel, and to state his case to the Jewish community. Yet, after three weeks of repeated telephone calls, two chats with his Deputy Communications Director, and several left voicemail messages, I have yet to receive a callback to schedule an interview…. In Tennessee one of Ron Paul’s biggest internet organizers is neo-Nazi leader Will Williams, who is a southern point person for the National Alliance Party, the largest neo-Nazi organization in the US. According to Andrew Walden, author of the American Thinker piece, Williams is in part responsible for the extreme numbers of “meet-up” individuals who have registered for Paul. Some 61,000 Ron Paul supporters are registered, compared to 3,400 for Barack Obama, 1,000 for Hillary Clinton, and 1,800 for Dennis Kucinich. Williams may also be responsible for the enormous amount of spam and comments received by anyone who dares criticize Ron Paul. 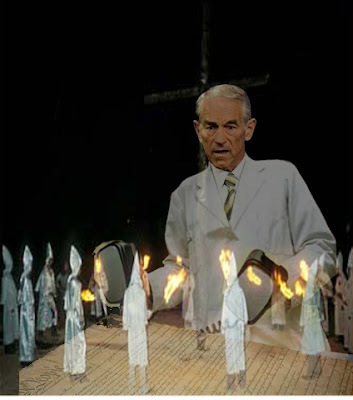 Williams is not the only white supremacist, KKK, or neo-Nazi supporter Ron Paul has. He is supported by David Duke and Pat Buchanan. Ron Unz, editor of Buchanan’s American Conservative magazine is also a Ron Paul supporter. Strangely enough Barry Manilow is also a Paul supporter as is Cindy Sheehan. There are ties to the American Nationalist Union and several serious anti-Semitic sites and organizations. Also supporting Paul are long time “Christian” conservatives like Howard Phillips and Chuck Baldwin who is closely associated with the Constitution Party. Dave Neiwert, quoting Chip Berlet, wrote “Those neo-Nazis have a First Amendment right to endorse Ron Paul, but Ron Paul has a moral obligation to disavow that donation." He added: "There's two issues: Why would anyone have to ask Ron Paul to disassociate himself from the endorsement of neo-Nazis? And the second is that when they did ask him, his silence spoke volumes about his values. You know, 'I don't enjoy the endorsement of neo-Nazis' — how hard is that to say? And why hasn't he refunded it? It's not like this is a gray area." Currently Paul is polling about 7% in New Hampshire and 8% in South Carolina. SJ Reidhead is a writer and political junkie who lives in Lincoln County, New Mexico and is the author of two western novels, and has several non- fiction books about Tombstone and Wyatt Earp. She is currently counting hits her Pink Flamingo blog and is working on an expose of the anti-immigration movement as well as forming her own publishing company.